That is what I got at the end of the 6 hours drive. That is if they are fast. If not it might take up to 8 hours on the rocky mountain roads. To be honest, it was a painful decision my partner and I had to make while we planned for the trip. It ain’t easy, to make a 12 hour trip to and fro just to visit an area for 2D2N. But like me tell you straight up, it was all worth it. Even my partner who was so reluctant to visit El Nido had to admit it was all worth it at the end of the trip. We took up Tour A after much research on the internet. Since we can only afford 1 island hopping tour, we took up the much recommended one. I can only say pictures and words do not do justice to the place. Back to some introduction of the island.. For those who have been to Phuket or Krabi, the nature of the shops there are quite similar, but unspoiled by the waves of tourist who travel there. I supposed it is because of the long tedious journey to reach this unlikely haven. When you arrived at El Nido, you have to take a tuk tuk lookalike or walk into the town proper as the buses and vans are not allowed in due to the nature of narrow roads and to protect the town from massive damages that might be caused by traffic. 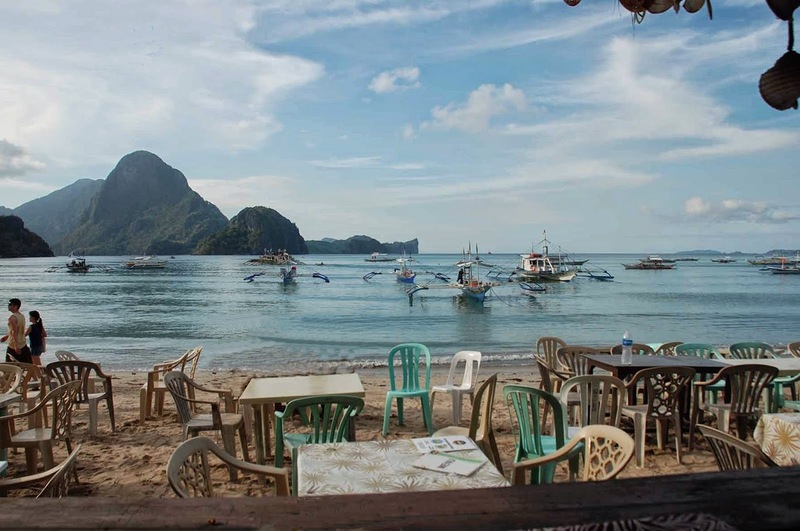 There are 2 main beaches in El Nido proper, one being along the shop front of the numerous restaurants operating there and one is the infamous La Cabanas. We have to trek though this road for about 2 minutes to reach the beach. To be honest, It may look like nothing here, but when we reach the entrance to this road, it was a little horrifying, it looked nothing near the coast. But the view is so rewarding. Like a scene we see in movies, dining along the beach, soaking our feet in the cooling sea is the best feeling ever!! As we spend our night indulging in live bands, cold beer and feet in the water, our journey in Philippines is slowly coming to the end. The following morning, we went to the long anticipated Tour A!! Wheeee! Bundles of excitement on this one. We waited for the tuk tuk to come and pick us up to the beach area where we onboard our hire for the day! Funny thing is when the tuk tuk came, there was already 2 ang mos on board. Mind you, the tuk tuks here are unlike those in Bangkok which are relatively larger. Tuk-tuks here can fetch up to 5 people or maybe 6 with petite size. But to be honest, 2 is the most comfortable number. Anyway how, we managed to get to the shop to register our names and get our goggles and supplies for the day and we head out!!! The rustic feel of this place is no joke. Think about Phuket or Krabi or Langkawi island hopping, the boat usually gets to a dock or ferry for you to board right, this is not the case here. We have to walk like 15m into the sea? Hahahaha. It was rather shocking for me since I’m really short. The water is already almost at my chest level when I reached the boat. Only entrance to the secret lagoon..